LinkedIn has seen explosive growth in the number of articles published on the platform. It also plays an increasingly significant role in content distribution for articles published on other domains. 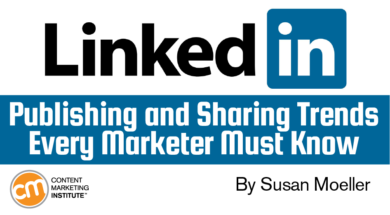 For some topics, LinkedIn is the most important network for social shares. 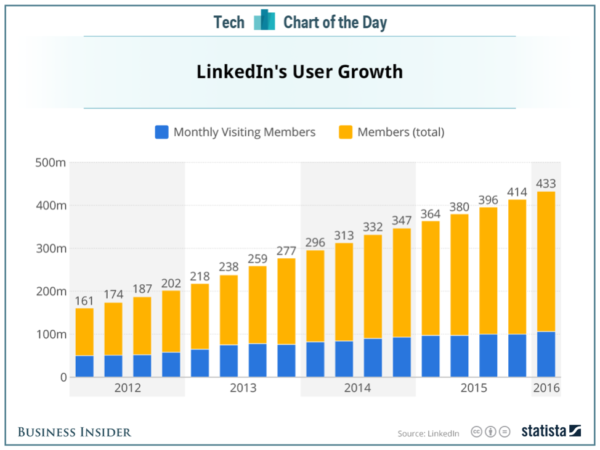 The number of LinkedIn users also is growing, reaching over 430 million in 2016, as Business Insider reports. 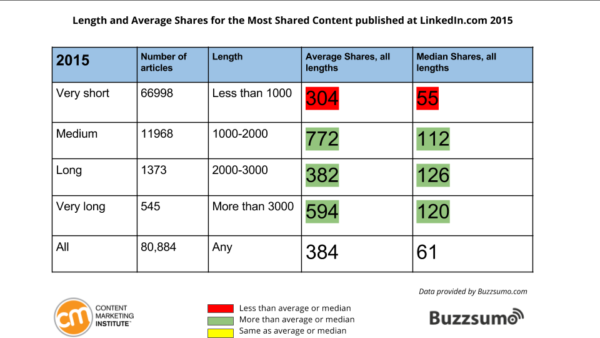 LinkedIn has led the way among social networks offering the option to post blog-length content. According to data provided by BuzzSumo, at the beginning of 2014, users published approximately 1,000 articles each month. One year later, users published more than 80,000 articles monthly, and a year ago that number hit 130,000. LinkedIn’s volume of growth may not have reached content shock. LinkedIn was the primary content distribution network for some topics. Long-form content is shared more than short posts are. Official influencer recognition isn’t necessary to earn a high-share volume (but it helps!). 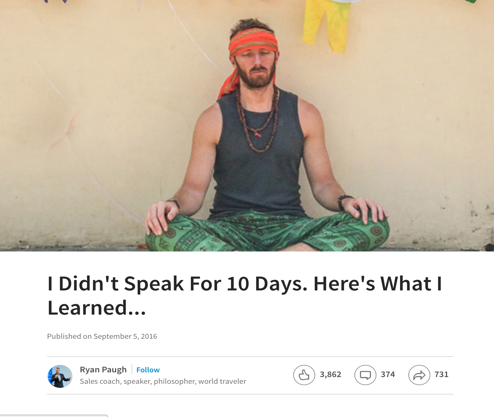 Original content on LinkedIn earns few referral links. The network isn’t sending signals that users have more content than they want to interact with. Data from 2015 and 2016 shows that the total shares of content published on the platform has more than doubled, from 31 million to almost 73 million. And, the average number of shares per post has increased by 43%. It’s logical that LinkedIn will become saturated and shares will drop at some point. But, the relatively narrow focus of the network could work to accelerate or decelerate the process. Will the need for niche content less available elsewhere sustain growth? Or will the demand for a narrow set of articles be quickly met and rapidly curtail growth? I’m not sure, and the data doesn’t answer the question. But, in 2017, I plan to publish more on LinkedIn. After all, the key to marketing well is to see a wave and ride it, not pass on good opportunities because they won’t last more than a year or two. LinkedIn surpasses Facebook and Twitter for social shares in many B2B areas even when the shared content is not published on LinkedIn. 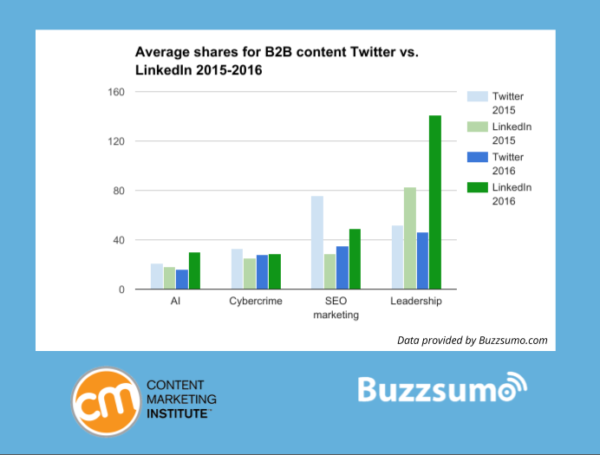 The data on B2B content sharing surprised me. 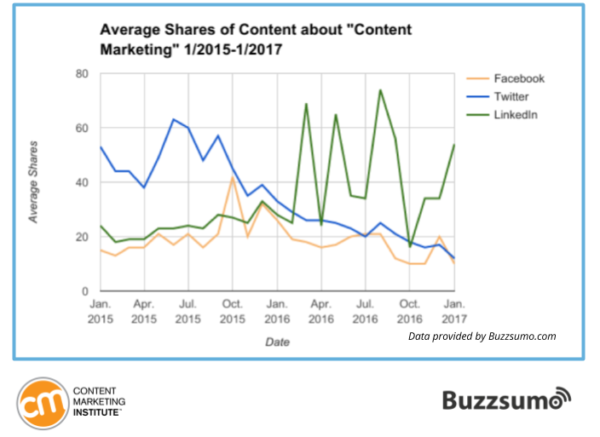 There appears to be a substantial shift from B2B content primarily shared on Twitter to B2B content primarily shared on LinkedIn. Content on the topic of “content marketing” exemplifies the trend. When we analyzed content on four B2B topics — artificial intelligence, SEO marketing, leadership, and cybercrime — here’s what we found between November 2015 and 2016. One caveat in the string of good news about LinkedIn is this: Content published on LinkedIn gets few referral or back links. And those low numbers have decreased since LinkedIn allowed all members to publish original content. In 2013, when publishing was limited to LinkedIn-selected influencers, the average number of links earned per post was three, with a median of zero. In 2015 and 2016, when publishing was available to all, the average earned link was less than one — between 0.3 and 0.5 on average — and the median was zero. In this area, LinkedIn mirrors most sites. Our 2015 analysis of 1 million blog posts from many domains showed 75% didn’t earn any referring domain links. 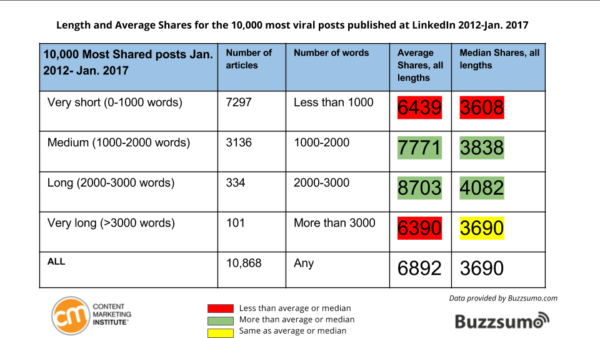 Across the years we researched, short content — 1,000 words or less — dominated posts published on LinkedIn. But, longer posts — 1,000 to 3,000 words — were much more likely to be shared. The length-vs.-share trend held steady each year as well. LinkedIn may be the last great word-nerd refuge from the pressure to add images and videos to perfectly good prose. I sampled successful long-form posts from 2016, filtering out those with authors designated as LinkedIn Influencers. None of the posts had images beyond the initial banner. Some had text-based graphic elements like bullet points or non-traditional spacing, but none were rich in images, charts, or graphs. One possible explanation is that LinkedIn sharing is based more on the perceived importance of the author, with impressive job titles grabbing attention as effectively as visual content. Another reason could be LinkedIn’s structure and promotion as a professional network, which minimizes any expectation for entertaining content. It will be interesting to see if the success of text-heavy posts will be replaced by more image-rich content in the months to come. 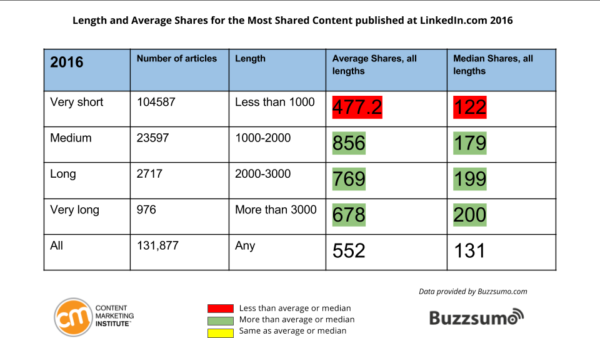 To determine the topics appealing to people who share content on LinkedIn, I looked at the headlines for content in the top 25% of social shares in 2015 and 2016, as well as for the cumulative content from 2012-2017. How-to posts dominated the headlines for the most-shared content between 2012 and 2017. They focused on practical advice and many addressed work- and job-related issues. The most frequently used bigrams are noted in the chart. I was surprised at the use of personal pronouns, given that LinkedIn is a professional network. The effective headlines revealed a sense of collegiality in the heavily shared content. The personal elements helped the articles read more like advice from a mentor than a textbook. Lists, especially short lists, perform well on LinkedIn. The 500 most-shared articles in 2016 included 30 posts listing five or 10 items. Lists of longer than 20 items were less frequent. 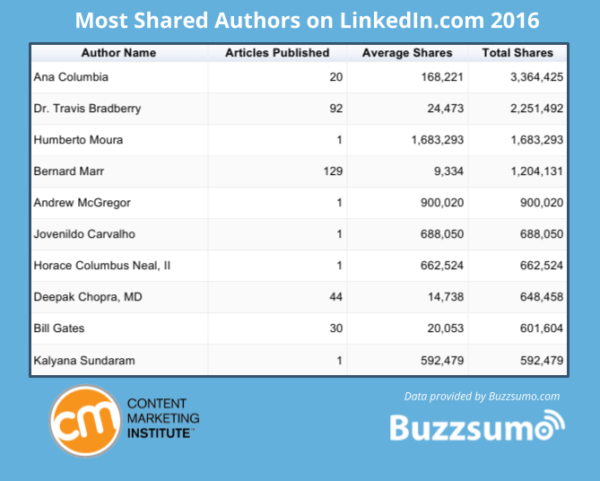 To determine how much official LinkedIn Influencer status affected social shares, I looked at a list from BuzzSumo of the 30 most-shared authors publishing on LinkedIn during 2015 and 2016. Only 12 (2015) and 13 (2016) were designated as LinkedIn Influencers. Users on the platform are a bit more democratic in their sharing preferences than I expected. The top-shared authors designated by BuzzSumo also didn’t uniformly publish a lot. In some cases, they published only one or two articles on the platform. Others were more prolific. 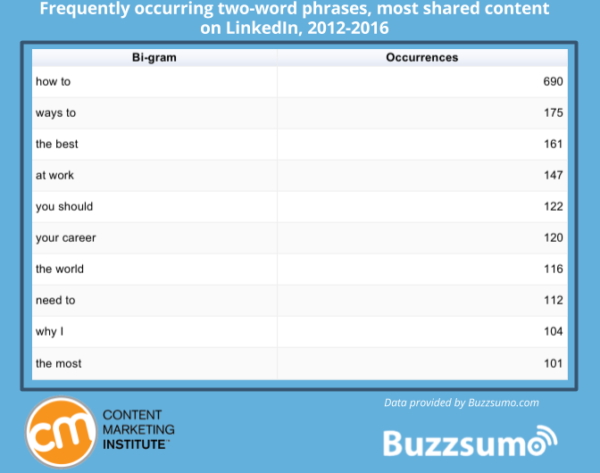 Of the 10,000 most-shared content pieces in the last five years, only 6% (669) were written by those identified by LinkedIn as its most influential writers. 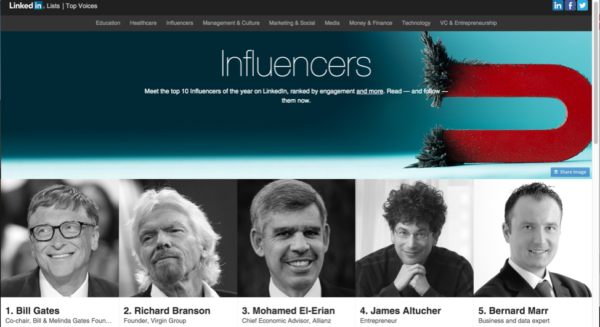 While it certainly helps to be officially designated as an influencer by LinkedIn, it’s also possible to succeed on the platform without any special status. It’s also not necessary to publish frequently or in English to have great success. Given that shares from LinkedIn are growing, and the platform is accessible to everyone, now is the time to consider making it part of or expanding its role in your B2B content marketing strategy.